How many times have you set a goal only to let loose of the idea the minute adversity hits you? As Nietzche relates, the reason why you don’t accomplish your goal is because you’re inflexible in your path yet flexible on your goal. For instance, let’s say your goal is to break out of your 8 car shell and sell 15 cars this month- a few days later you find yourself backing back into your 8 car garage again. Like putting your hand on a hot stove, the reason why you’re stuck in your career is because you’re inflexible to your comfort zone-the minute you feel the discomfort, pain, and setbacks, you immediately drop the notion of doubling your sales output and fall back into the warmth of familiarity. If you want the taste of success, then you must become dyslexic in the way that you eat it- flip your inflexible/flexible mindset around. Be tenacious and lock into your goal, yet remain adaptively flexible to the adversity that comes against you. 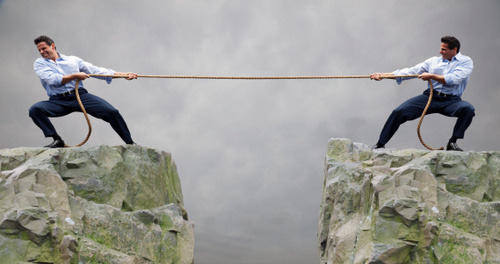 Like everyone, you’ll have setbacks, rollbacks, turndowns, rejections, and misfortunes this month-every month for that matter, but what separates extraordinary salespeople from ordinary ones is that EXTRAordinary salespeople don’t allow adversities to have any permanence in their career. Ordinary salespeople hold onto unforeseen, uncontrollable circumstances-thus letting go of their goals and sinking their month, while extraordinary salespeople handle the adversities by learning how to manage the setbacks (flexible) while still moving forward toward their goal (inflexible). Don’t adapt the goal to the path; adapt the path to the goal. Why do we alienate what we have and covet what we don’t? We’re quick to ignore what is in our search for what else in life–always longing for the shiny balls of strengths that everyone else seem to possess-ignorant of our own. You have strengths that you do not fully utilize, why? Because your strengths aren’t painful-and when it doesn’t cause discomfort, when something comes so effortlessly, so naturally, it often gets taken for granted. For some people what may take them months to read a book, you complete it in a few hours; while some unsuccessfully try to cram into memory a blur of stats, facts, reviews, rebuttals and closes, you’re one and done-thanks to your photographic memory; where some find meeting new people very awkward, you have the uncanny ability to get a complete stranger to open up and share their whole life story with you in minutes. You have dozens of strengths-strengths that others could only wish for, yet years later you still find yourself standing in the familiar rut of, average at best, on the way to your grave of untapped potential. Like a dog faithful to its abusive master, your strengths are present, but underserved. In the absence of tension, strengths morph into weaknesses. You can’t walk between skyscrapers on a loose tightrope; you won’t win the Tour de France with slack in your chain; you’ll never be able to play like Hendrix with loose guitar strings, and you’ll never realize your full potential without the tension. Your greatest opportunity for growth comes from the tension between complacency and discontent. Many of your greatest strengths were unearthed during your weakest moments in life-all thanks to tension. When there were moments that you were physically, mentally, spiritually, or financially at your rope’s end, it was tension that tied the knot enabling you to hold on. You weren’t focused on the realities of what couldn’t be done-you were too focused on the possibilities of what had to be done. And like the tenacious jaws of a rabid dog you refused to let go- narrowing your focus, upping your intensity, and stretching your resolve…until tension finally broke the obstacle standing in your way. And that was during your weakest, lowest moments in life. Just think if you treated your strengths much the same way? Instead of using your strengths as a crutch, limping into the kingdoms of Just Enough, what if you used it instead to vault into newer, higher realms of possibilities? If you did it when you didn’t think you had it [in you], then why, when you know you have it [in you] don’t you use it to do more? In the sport of pole-vaulting, the faster you run the higher you’ll go. 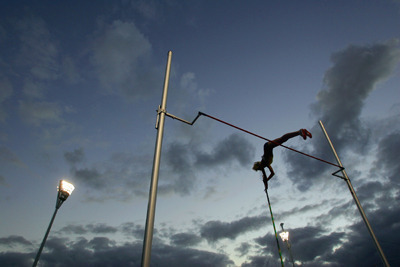 Energy is transferred from the runner’s feet to the pole, vaulting him over the bar. Your energy is found in your strengths, the problem is you’re not running fast enough. It’s time to stop strolling and start running. Sure, adding tension causes discomfort, soreness, and fatigue, but that’s where the growth is found and that’s precisely the point when most people let up-when it begins to hurt. We may not always like the effort, but we always enjoy the results. Keep you lines of success tight by dripping tension as needed. If you plan on going higher, you’re going to have to run faster. Set the bar and lace up.